NMM 5949. Clarinet in C by Bouchman, Annonay, France, ca. 1825. A lovely instrument in excellent condition by a little-known maker working in a small town near Lyon in the south of France, where instrument-making was actively pursued in the 19th century. 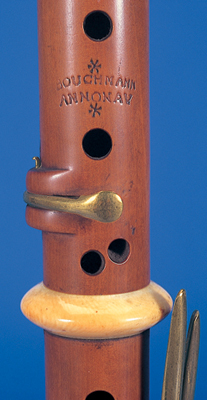 Built of boxwood with ivory ferrules, it has seven keys. The round key flaps to which the pads are glued are curved to conform with the curvature of the body, a unique feature not normally seen that gives the instrument an unusually sleek appearance. 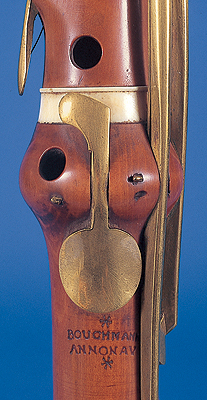 A metal tuning slide on the inside of the bore, between the barrel and the top joint, became a feature that was widely used well into the 20th century, but often causes the barrel to crack, as the wood shrinks. Ex coll. : William J. Maynard, New York. Board of Trustees, 1996. Literature: Deborah Check Reeves, "The Clarinets at The Shrine to Music Museum," The Clarinet 24, No. 3 (May/June 1997), pp. 44-46. André P. Larson, Beethoven & Berlioz, Paris & Vienna: Musical Treasures from the Age of Revolution & Romance 1789-1848, with essay by John Koster, exhibition catalog, Washington Pavilion, Sioux Falls, South Dakota, September 12-November 2, 2003 (Vermillion: National Music Museum 2003), p. 47.